One of the things I’m learning about having a college student for a kid: My role as his parent demands quite new behaviors from me. When something happens to him–let’s say the end of a relationship, an untimely migraine headache, or even just a hassle with a class schedule–where I once might have swooped in with advice or a cup of tea, I’m learning that my role now is to, well, just kind of sit still. Preferably in silence. It’s been… let’s just say, it’s been a learning experience—and this from someone who was never one of those helicopter moms who made a life out of rescuing her kids. The wonderful writer Anne Lamott became a grandmother not too long ago, an experience she learned provided a whole new opportunity to sit still and let her adult son, now a parent himself, learn his own lessons. She came up with an acronym to help her remember that it’s no longer her role to step in and run the show: W.A.I.T., which stands for Why Am I Talking? You can read about it here and here. Why am I talking? What purpose do I wish my words to serve? All too often, I can talk for unhelpful reasons, like wanting to keep my kids engaged with me, wanting to protect them (or myself) from uncomfortable feelings—or thinking my words can serve as a kind of talisman to protect them in unsafe situations. One day I heard a radio show about the drug MDMA, and I commented to my high-school daughter that I thought I’d give the freshman a call, you know, just to remind him to steer clear of parties where kids might be trying it. “Don’t,” she suggested, kindly hiding her impulse to roll her eyes. “He’s already learned all that, and at this point, your telling him isn’t going to do anything but irritate him.” She had a point. Still, I had this feeling that if I could just warn him against the drug (again), I could protect him. I know I’m not the only mom who’s wanted to dole out desperate little pieces of advice out of a deeply engrained instinct to protect my kids. “Don’t climb too high!” “Hold on tight!” “Be careful!” Now, that’s not to say I’m never going to give my freshman a nugget of advice—but I suppose I should start by knowing why I want to do it in the first place, and follow up by asking myself whether it’s something the kid really doesn’t already know. Why am I talking? If I’m the one doing the talking, what’s my kid doing? Is he listening? Is he tuning out? Is he wishing he could get out of the room? And what about me? Am I thinking about the kid at all—or am I just satisfying my desire to control him? In other words, are he and I actually communicating, or am I just lecturing, or worse, filling space? Have I asked him his point of view? Am I letting it be as real as mine feels to me? Why am I talking? Because most of the time, listening is better. And if you’re so inclined, prayer is too (as long as we’re talking about private, silent, open-hearted prayer, not the spoken kind that seeks to guilt-trip the kid, which is really just another form of exerting control). 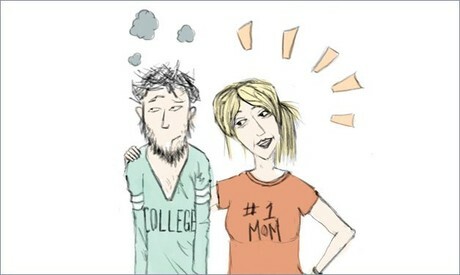 Don’t get me wrong—I’m not giving my college kid the silent treatment, not by any stretch of the imagination! But now that my freshman is more on his own, I’m trying to be more aware of what I’m saying to him and why, so that I give him the space to grow into a healthy adult (and not coincidentally, hopefully one who wants to spend time with me!). Your pieces and advice / thoughts just keep getting better, Chris! Jen can certainly apply that to her younger children as well — as she said. I am thinking also that some of your thoughts could be modified to be used with even very young children — that is, to give them the space and time to experience, learn, grow, make mistakes, and have accidents. And then, of course, being there for hugs as needed!